Microsoft revealed plans on Friday to turn off the metadata service for certain media product and operating system combinations. The company maintains two media products right now that ship with various versions of the Windows operating system; Windows Media Center, only available in Windows 7 and Windows 8.1, and Windows Media Player, available in all supported versions of Windows. Both programs may use the metadata service to retrieve information about media from Microsoft servers. If a song is playing, the metadata service might retrieve the title, artist or genre of the song, or cover art. Movie and TV show metadata may include actor and director names, or genre. Microsoft plans to shut down the metadata service for Windows Media Center entirely. The company did not include Windows Media Center in Windows 10 (but you may get it to install), which it released in 2015, and it was clear right then and there that the multimedia player would be on its way out. Windows 7 users who run Windows Media Player will also have to do without the metadata service; Microsoft will shut down the service for Windows Media Player running on Windows 7 going forward but not for Windows Media Player running on Windows 8, 8.1 or 10. The following table highlights how different operating systems are affected. Microsoft notes that existing metadata will remain available in the player (metadata that was downloaded already) and that the termination won't affect primary features of either media player. Some features, those that rely on metadata, may be affected, however. According to Microsoft, the decision was made based on customer feedback and usage data. Windows customers who use Windows Media Center on all supported versions of Windows or Windows Media Player on Windows 7, won't be able to update or download metadata from Microsoft's metadata service anymore going forward. It is unclear why Microsoft made the decision to terminate the metadata service this year and not next. Windows 7 runs out of support in January 2020; terminating the service then would certainly sit better with customers who use the service. You can check out our Windows Media Center alternatives article to find a suitable media player that continues to support metadata. Microsoft & alas, mozilla too often. internet user because of you & the wonderful community you have here. I have a question for you …Do you use Linux much, or at all? Windows is the main OS that I use, primarily for this site and others as I cover Windows more than other operating systems. I don’t feel bad about Windows Media Center users. If you were using Windows Media Center, it’s your fault, you should never rely on a Microsoft program, you should invest your time and energy in better programs like Plex or Kodi. It’s your fault, never use or rely to a Microsoft program, Microsoft will kill it if it stops fitting their agenda, always rely to third party programs. Plex forces one to use thier crappy built in media player and Kodi is still a flustercluck but Plex has a simple and beautiful GUI. You can combine an older version of plex with a few other “old” things to use Plex as your front end and VLC as the player. This works great if you have a large local library as it automatically fills in almost all of the metadata for you. I posted “some” details over on the plex fourms. I was using it with a 6 Tuner Ceton cable card tuner, I actually invested a lot into that hardware but it never took of the way it could have, people wanted to pay extra to the cable companies for instant gratification even at the cost of flexibility I love my Media Center DVR and am surprised someone hasn’t stepped up to fill the gap when Ceton pulled the plug a year or so ago! The equipment just worked and worked well, silicon dust still makes similar equipment but it’s like comparing Beta to VHS they are completely different animals! And Silicon dust started charging for the EPG and DVR function, I don’t mind paying if someone comes out with a alternative to MC that works with my equipment, Kodi doesn’t nothing but media center does! I think I have to make backups of my system drives that are running these cards because they require a activation simular to a Windows activation key to decode encrypted video, it’s probably going to become a pile of useless junk in a closet one day for me? But until then I like being able to record 6 channels per card and watch upto 6 separate live streams on different TVs in my house without having a cable box connected to each tv and alynot having to pay the cable company rent for 6 boxes that adds up! The years I have used Media Center as a Cable DVR has saved me thousands in rental fees and it paid for the equipment over time! Every good thing has to end one day! I guess I’ll probably be cutting the cord permanently and just pay for internet once MC actually dies! for OTA stuff mediaportal or emby work better for me, and I do have paid plex as well as a kodi box. ran mediaportal for few years, couple months ago migrated to emby server (can run on windows or nix based) pointed them to my silicondust hdhr tuners abd went from there. Some how I will carry on, it will be hard at first but through strength and determination I will make it. This is why I always use software that are fully functional offline. Never get into that cloud based connected nonsense. MS may be removing the last reason to allow their Media Center through our firewalls, or indeed to tolerate it at all any longer. Just so many better (and safer) choices today. I don’t believe Microsoft’s explanation. Do you? Yeah, let’s sabotage a bit more for people who intend to keep Windows 7 machines as media players. “Now they will all most cetainly move to Windows 10!!!! !” There’s plenty of music/videoplayers on linux that blow WMP/WMC out of the water anyway, but nonetheless: yet another brilliant RICHARD move by our deranged satanic tyrant overlords in Redmond. Just another little “nudge” toward W10. Microsoft support is a lot like buying a loaf of bread which states on the packaging that it will be “good until the twenty-first”, but bits of it start going moldy ten days early. After reading your article I uninstalled Windows Media Player and Installed VLC. I don’t see any dates. Does anyone have any idea when we can see this change? I’ve half-heartedly looked for alternatives, because I knew the end would be coming, but honestly it’s been hard to find a great replacement. Media Center just works, and every member of the family can use it easily. They listened to customer feedback you said? I’m sure they got many emails requesting Media Center to be degraded and we know that Microsoft will do anything to keep their customers happy. Sure. And pigs can fly. This is really bad news for both of the people using Windows Media Center. On the upside, when they seek out an alternative, these two folks will be able to play aac, mp4, mkv, flac, etc as well as receive accurate metadata for their first time. PS: Thanks Martin for the heads up on all the upcoming Firefox changes conveyed in other articles. These days, we need a PhD and a staff of 12 to keep abreast of & operate Firefox. OK…we all know MS is not to be trusted in Anything it says as it is only interested in one thing…Money. That said and known by us, what exactly is a tech-challenged person like myself to use? Am running Win7 64-bit on HP Home Premium. 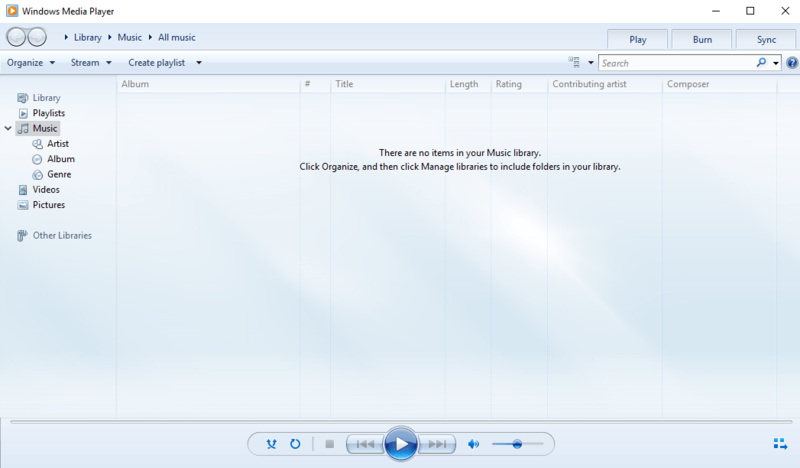 Media Player has been the only thing I have ever used and have to say it was easy for someone like myself to use. I have no plans to switch to Win10…too many scary things happen, especially in MS Updates and “fixes”. I have my music on MP, which I also use to download to my MP3, and videos of my grandkids in their Cheer routines. Other pix of great-grandbabies are on MC. I will lose all of this? Can I still see the pix and videos of family without MS support? And for how long? Also watch my dvds through MC and know that if that goes I will no longer be able to enjoy them. Did download VLC months ago but have no idea about using it right now. Is that a good one for someone like myself? almost forgot I play casual games downloaded to my computer…have quite a few of them: Hidden Object, jigsaw puzzles, Match3, MahJong and games like that, not the shooter and/or role-playing games. Personally, I think it’s a pity. wma is an an outstanding codec and WMP could have been great. But MS as always, missed the mark by not making wma/wmv open source and by crippling its codecs with anti-user DRM capabilities. It also didn’t help that when you start WMP your network connections light up like an xmas tree calling home to at least 8 different domains. @GGmaS Alternatives to WMP? You’re in luck, there are many and will greatly increase your ability to play music/video. foobar’s simplicity takes a while to get used, but it is very powerful under the hood (highly configurable, true 24 bit, spectrum analysis tools, playlist, library search, etc…). For Audio #2, there is also Winamp my 2nd fav and another near perfect tool, but the interface is not for everyone. You can get the last great, usable Winamp version using the link below. For Video, it’s a bit more complex. Kodi is great for tech types but not for average users (until the need & interest arises that is). Youtube will continue to work so you need not worry there. VLC is very easy to use and you only have to learn a few keyboard shortcuts; the most important follow. Press the spacebar to toggle start/stop a vid from playing. Press F to toggle from small size to full screen and again to revert. Press Alt-F4 once to exit. That’s all you really need to start using vlc. Once you get used to it, the keyboard shortcuts are customizable and you can use the link below to learn more shortcuts. Just be patient to learn your new tools and you’ll soon be glad this change occurred. If anyone here is old enough to remember when software wasn’t “connected” IE: DOS and Windows 3.0 – 3.1 3.11 (W Networking) ? Systems that may be running those (windows back then wasn’t a OS it was installed on a DOS system) they would still work today and beyond! Why? Because Microsoft can’t see those systems online and have no way to influence them remotely! I used to be a Network Administrator for a small company in the not so distant past and was responsible for the installation and up keep of several dozen internally networked systems! We did have a T1 line connecting our main location with a smaller location across town, it was just a super fast 24/7 phone line that was secure unlike today’s internet that everyone shares where hackers and greedy corporations can influence or destroy our Computers remotely. Ha, then you also remember spending 2 hours tweaking those SPX/IPX network drivers to squeeze them in under the video memory and over the 640k mark to save an extra hair of precious memory! Indeed, the land of irqs, dma channels, and that era when users could actually have full control over their computers. I miss those days big time. Maybe it was youth or the newness of it all but the small community feel of bbs’ were spectacular compared to the censored shite, advertising, and propaganda corporations hand feed the masses today. One reason I like ghacks, Martin is more about tech than other drivers, thanks Martin!.